Haworth white papers: sophisticated sensors could contribute to a healthier and happier workforce by tracking the way offices are used and adjusting them automatically, according to new research by US furniture giant Haworth. Used properly, the technology could turn offices into places that employees choose to be in for their overall wellbeing, says Haworth's Enabling the Organic Workspace: Emerging Technologies that Focus on People, Not Just Space white paper. "This is an amazing shift in design thinking," said Haworth's research programme manager Mike Bahr, referring to the notion that better office design could improve people's lives. "If so, why wouldn't you want to work at the office?" he said. By constantly monitoring environmental conditions, the way space is being used and even employee's emotional and physical wellbeing, the office of the future will be able to react automatically, the research predicts. Sensors will enable workspaces to shape-shift for maximum efficiency, alter temperature and lighting levels, and make adjustments when workers are getting bored or frustrated, the report finds. This could transform the way employees perceive their workplace. "Haworth believes new technologies can make work better by helping people be their best and soon we'll see employees drawn to the office in their search for increased wellbeing, engagement, and effectiveness," says Haworth's paper. "Why? Because their workspace responds to how they work best." "The offices of the future will be less a place for work only but more a place where everyone likes to be and spend his or her time," agreed Nick Sohenmann, founder of German studio Future Candy, who has been working with Haworth to implement the findings at a pilot project for a major company headquarters in Germany. Employees will increasingly use the workplace "to organise their life and work, spend free time with colleagues or even just take a moment to relax," Sohenmann said. This means that the focus of office design will shift from maximising available space to responding to the individual people inside it. "The past focus of space and building management has missed the greatest opportunity of all: to directly monitor the needs of the occupants, not just the function of the space," says the white paper. "The promise of new technologies can be intoxicating," it says. "The real test: does any new technology help people? It's tempting to be swept away by the latest gadget, but we need to ensure people come first." Haworth's paper details a number of examples of how sensor technology can be used to create a better environment that workers feel happier spending time in. 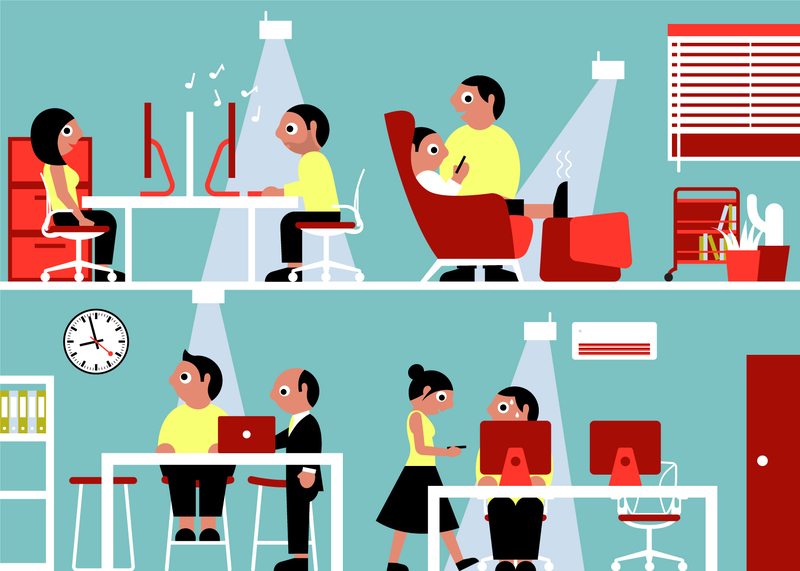 Occupancy sensors that monitor how employees are using a space are already available and give designers the information to create more effective interior layouts. In future they could generate data for a computer system that adapts a space automatically, suggests Haworth. For example, a meeting room might work better as a less formal area without a central boardroom-style table one day, and a video-conference space the next. But the white paper says that new advances in sensors that monitor environmental factors like the intensity of light, sound and air quality are also turning these into key tools for better workspaces. A smelly office, feeling too hot or too cold, or a colleague's loud music could all be easily assessed and addressed to make an employee happier. "Light intensity and spectrum, sound amplitude and direction, air quality, odour, and occupant location and activity may soon all be integrated to provide the more detailed information necessary for the environmental systems to react to actual user needs," it says. More controversially, Haworth's white paper suggests that biometric sensors could also provide insight into less obvious factors like restlessness, boredom and stress, as well as poor posture or too much screen time. Bahr said that sensors would even be able to monitor emotions, and described this as a "future frontier" for the technology. "Sensors may monitor heart rate, gaze direction, facial temperature, skin moisture, skin temperature, and brain waves to gauge if the user is focused on intense work, is recharging, or is frustrated," says the paper. Used in combination, these systems could help create workplaces that can adjust – physically and environmentally – in response to the conscious and unconscious behaviour of the people inside them. "For instance, the system may monitor a meeting and determine that most people have been sitting for 20 minutes with little major posture change, or if there has been a single dominant speaker for the past 10 minutes, or that the level of carbon dioxide has exceeded a threshold," says the paper. "Facial muscle strain and skin temperature can be evaluated to confirm participants' attention is waning," it continues. "In response, the system may adjust light intensity and colour, slightly lowering the temperature, increasing airflow, and it may even add specific scents to the air in an attempt to bring the occupants back to a state of attention"
Haworth, which was founded in 1948 and is one of the world's largest office furniture manufacturers, produced the paper as part of its ongoing investigations into the future of workplace design and employee wellbeing. Bahr, who is part of Haworth's Global Workplace Research team and led this latest white paper, said that it was becoming increasingly clear that good office design could help staff beyond the workplace. "One of our other primary research projects has connected design with fundamental wellbeing, as measured by improved sleep, lower stress symptoms, etc," said Bahr. "This is amazing – it strongly suggests that design of the workspace can impact the private lives of employees." According to Bahr, the purpose of the white paper was the broaden the discussion about how technology can play a role in the way we work. "Interesting technology has crept into every aspect of our daily lives," he said. "We want to focus on those issues that impact us at a fundamental level, such as being able to concentrate more deeply and longer, low-value busywork [tasks that fill time but have no real value], or developing spaces that can maximise group work, or that that can adapt to new uses." "We want designers to guide their clients and make informed decisions about building systems and the internet of things," added Bahr. "Select systems that allow flexibility in use and an open communication protocol with other systems – don't select technology because it is 'bright and shiny' but select it based on its ability to work with other systems." Occupancy sensors are the technology Haworth's clients are currently most curious about. These are already having a significant impact on workplace design, according to Dominic Dautner, Haworth's director of technology and shared workspaces. "These sensors and monitoring systems can provide detailed 'actual' usage data on spaces, workstyles, number of occupants in a space, activities performed (tools used in room), room scheduling and availability, etc," he explained. "This enables the company to react quickly to the changing needs of the knowledge workers and floorplate designs to ensure a happy and productive workforce." But the white paper acknowledges that some employees could be worried about the idea of being monitored if this technology is used to simply track their performance. It is possible to use individual seat sensors, for example, to monitor the time employees spend at their desks. The sense of being watched by Big Brother could counteract potential improvements in employee performance and wellbeing. Employees need to feel comfortable with the technologies around them. "There is a lot of work to be done in this area," said Bahr. "Privacy and technology have a very complicated relationship, and personal information within a business setting is, rightfully, a very sensitive topic." "We need to turn the conversation away from the presumed punitive reason for monitoring and towards the positives, while still protecting the privacy of each employee." Haworth's report also cautions that these sensor technologies will only become really effective if they are fully integrated into office design. Designers working on new spaces now need to think about how to future-proof office environments to accommodate the increasing presence of technology. "These ideas may sound like science fiction. They are not," says the white paper. "It won't be long until we have modular systems that allow a range of sensors to be plugged into tracks on walls, ceilings, or even furniture partitions," it says. "Although these systems are rapidly evolving and we do not know the specifics of what may be available in the market, we still can prepare for change and help future-proof spaces. Considering person-centred organisational needs, designers can take a holistic approach and prepare." Future Candy, which specialises in advising companies on how to implement new technologies, is working with skincare giant Beiersdorf – which is behind brands like the Nivea range of moisturisers – to integrate some of these ideas into the interior design of its new headquarters in Hamburg-Eimsbüttel. Designed by Hamburg-based architect Hadi Teherani, the Beiersdorf campus is due to open in 2020, and Future Candy is investigating the use of sensors to create individualised work environments for each employee as they move around the workspace. "We have not discussed only one technology but rather the entire setup of a smart and cloud-based office," said Sohnemann, who founded the studio in 2013. "In general the internal culture of every company has to become more digital," he said. "This means all people working at the company have to support the modern digital environment and embrace sensor systems as part of the smart office and not as a device to control them." But Beiersdorf still wants its new offices to feel "cosy". Sohnemann said that there was still a role for old-fashioned ideas about comfort and communication, and pointed out that offices for tech companies like Google and Facebook are increasingly designed to encourage more personal interaction. "The concept of campus style HQ offices is based on the idea of meeting and discussing business issues face-to-face," he said, "hence technology has to blend in and be supportive of this." This is the second in a series of articles produced by Dezeen in collaboration with Haworth, based on their white paper research documents. It is based on Haworth's latest white paper, Enabling the Organic Workspace: Emerging Technologies that Focus on People, Not Just Space. Illustrations are by Stephen Cheetham.